Jones on Fire is a fast-paced game about saving kittens and other tasks expected of a firefighter. Except instead of putting out fires, you dive through them as you save more cats. Now take whatever idea image is in your head and replace it with Bit.Trip Runner. As for Muertitos a Matching Puzzle, the title gives it away. This is a match three game with a touch of Mexican culture to keep things interesting. These games join Amelia | Kids Story Book, August Dynasty, Double Dragon Trilogy, Oddworld: Stranger's Wrath, One More Line, and Toy Defense. You have to pay over the average to get the new titles, which currently sits between $4 and $5. If you exceeded the average at the time you previously bought the bundle, then you will get Jones on Fire and Muertitos a Matching Puzzle automatically. 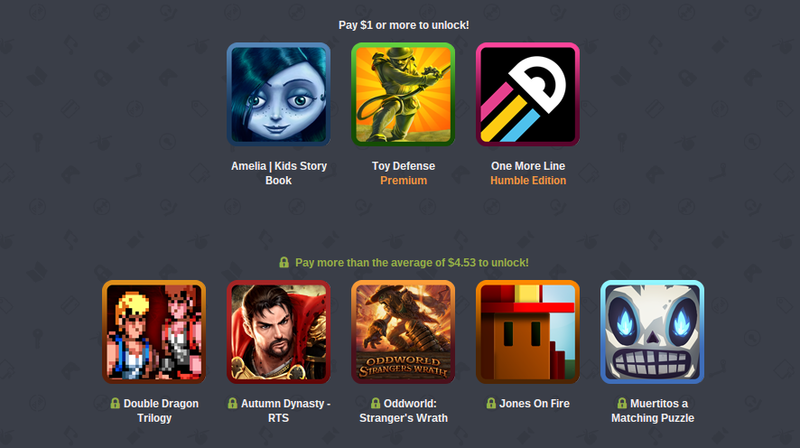 Since this is the second week of a Humble Bundle, it's time for us to give out 10 free bundles. Check out the rules below. We've got 10 codes that grant access to the full bundle of games. If you want to enter the drawing for a code, just leave a comment below. We'll choose 10 random winners tomorrow (September 15th). Good luck!